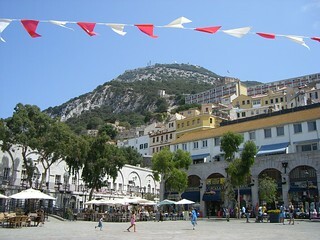 Gibraltar is located in a strategic position on the coast at the northern entrance to the Mediterranean Sea. It’s pretty small, 2.5 square miles and has been a British Territory since 1704. 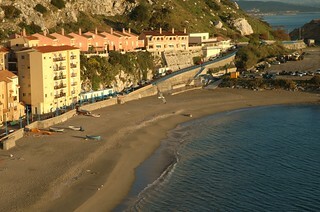 It’s a popular day trip for holiday makers in Spain with the Costa de la Luz to the west and Costa del Sol to the east. Gibraltar does have its own airport but due to lack of land the main road crosses the runway, so you can get caught for a few minutes at the traffic lights during take off’s and landings. 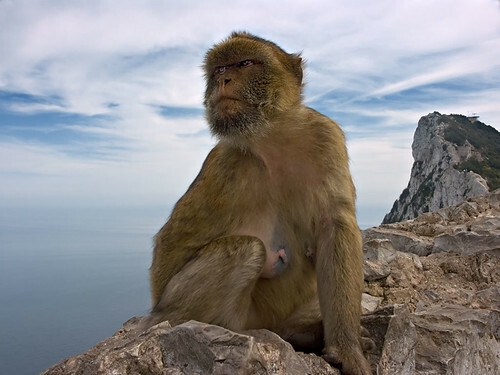 The famous Rock Apes, not really apes at all but Macaque tailless monkeys, live free on the upper reaches of the Rock. You can either walk or take a cable-car ride to the Upper Rock Nature Reserve. On a clear day you can see over to Africa, only 10 miles away. St Michael’s Cave, located in the reserve, has fulfilled many different roles as the site of duels, concerts and kitted out but never used military hospital during WW2. The Great Siege Tunnels inside the Rock are possibly the most impressive defence fortifications ever constructed by human hand. There is also an exhibition called “City Under Siege” with some of the first buildings constructed by the British, and graffiti dating back to 1726. During WW2 the tunnels were greatly expanded using drilling machinery. Casemate Square, once the site of public executions, is now a favourite place for residents and visitors to mingle and enjoy the varied entertainment in some famous bars like Lord Nelson’s. From Casemate Square Main Street, a shopper’s paradise extends south for about 800 metres, offering everything under the sun at the lowest duty-free prices in Western Europe. Don’t miss the Crystal Glass Factory, where you can watch the production of world-famous Gibraltar crystal, hand-blown using 2,000-year-old techniques. You can also purchase these beautiful creations right on the spot, at factory prices. Another must-see is the Gibraltar Museum, which offers a fascinating overview of Gibraltar’s history. The Kings Bastion Leisure Centre actually originated as a fortress against invading forces, but has been transformed into a remarkable complex of entertainment and sports activities, including an ice skating rink, amusement arcade, cinema, bowling, internet lounge and restaurants. Whale and dolphin watching is popular as there’s a good chance of sightings in the narrow channel. A one and a half hour trip costs around £25 for adults and £15 for kids under the age of 12. On the east side of the Rock is the little fishing village of Catalan Bay, where you will find a small but delightful sandy beach and quite a few restaurants and bars that cater mostly to beach goers. This area is usually less crowded and quieter than the main city beaches and the Church of Our Lady of Sorrows hosts a ceremony each year, when the statue of the Lady is carried to the beach for the blessing of the sea.